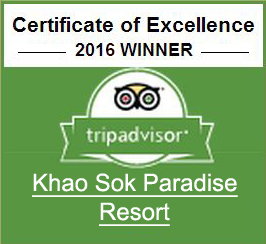 Prices Includes : All activities are provided by the Khao Sok Paradise Resort as per itinerary, as well as accommodation and meals. Not included : Drinks and national park entry fees. Our staff will meet guests directly at the Resort. Lunch at 12 noon after lunch, river tubing or canoeing (depending on the river level) down the Sok river. Dinner and stay overnight in your tree house. Breakfast, then transfer to the Chiew Larn lake. The boat journey to the raft houses takes about 1 hour. Relax by kayaking for a few hour, Lunch, then jungle trekking, explore the Nam Ta loo Cave or Diamond cave after what we will bring you back to the raft house and then to the resort. Dinner and stay overnight in your tree house. Breakfast, then spend an incredible morning at a dedicated elephant sanctuary operated by committed conservationists. 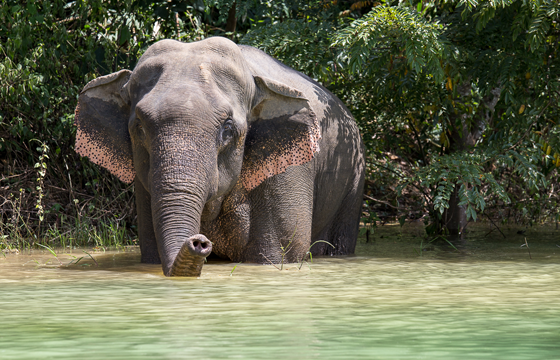 The sanctuary provides visitors with a cruelty-free elephant experience, enabling you to get up close and personal with these enormous but friendly giants, including hand feeding and bathing them at a waterfall. An unforgettable experience that also promotes the welfare and dignity of these amazingly placid pachyderms. Lunch, dinner and night safari, spotting wildlife in the jungle and stay overnight in your luxurious tree house. Breakfast, half day jungle trekking in the rain forest, lunch, dinner and stay overnight in your tree house. Breakfast then journey back; our staff will assist you with you check out.